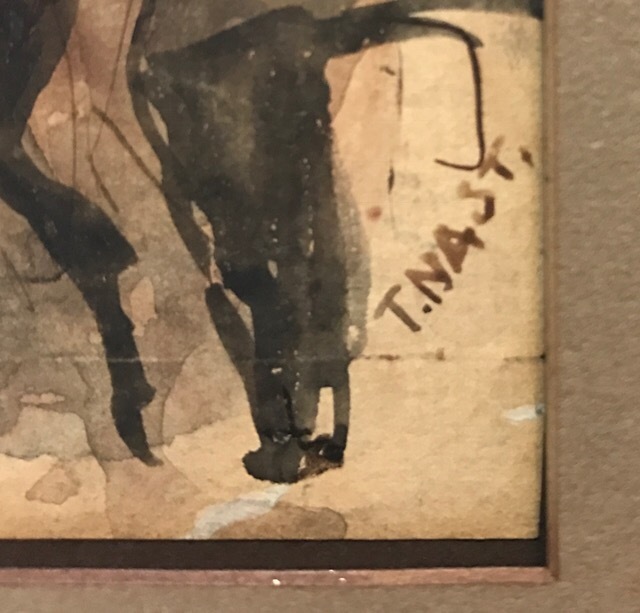 Through this website, I received an inquiry from Susan M., who recently acquired a small watercolor image, signed in print script, by T. Nast. Susan had little history on the image. Since “Nast + Chinese” often refers to this site, I was a natural person for her to contact. Nast watercolors are rare. 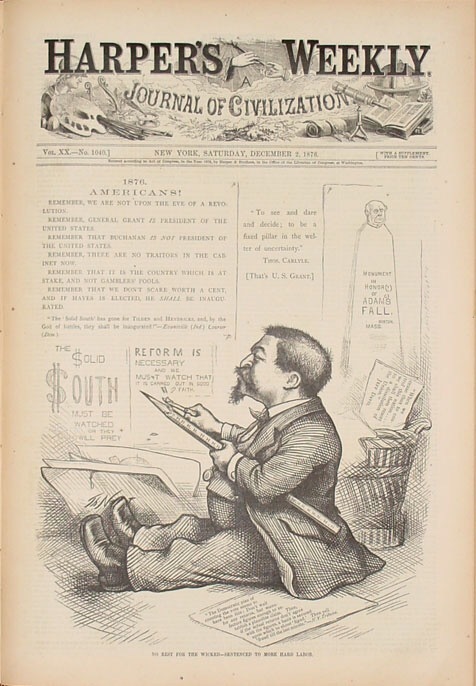 And this particular subject matter is historic, as it features the artist Thomas Nast in a self-portrait engaging in direct contact with a Chinese tobacconist in New York. Seeing it was a fantastic revelation! The man on the left with paper tucked under his right arm is most certainly Thomas Nast. At 5’5″ Nast was not a tall man, but when he included himself in his work, he depicted his physique as disproportionately tiny. This could be a young Nast, without the goatee. He is trying out a new cigar. In New York, the Chinese sold tobacco, specifically cigars, as well as teas and spices. The little man’s posture is erect and brave, with his rotund abdomen jutting out. Initially, I surmised that the much taller Chinese man to be a merchant. He is dressed in a familiar blue tunic and black pants, and rises from an oblong stool and leans over a small table toward his customer to offer the small man something. Did he just light Nast’s cigar, or is he offering Nast an alternative – an opium pipe? The slant of the Chinese eyes are quite exaggerated, but his expression is more friendly than sinister. Nast posture indicates little fear. The Chinese man’s feet are quite tiny. Tchen also discounted the theory of an opium pipe. It was customary for patrons to recline when smoking an opium pipe. At first glance, under the shadows of the table I thought I could make out artist’s strokes form in the shape of a pig, with its snout pointed down toward the center. Pigs were a stereotye often used to indicate the Chinese. If this is a pig, vague or not, it is Nast’s first use of the stereotype. Upon further inspection, I retract that opinion, and agree with Tchen that it is more likely Nast or the small youth is sitting, and the shape of his extended legs are less defined by the artist. Behind the customer, shadowy strokes create a sole figure witnessing the transaction. A single word hovers on the wall above the merchant’s arm, but it is difficult to make out the meaning. 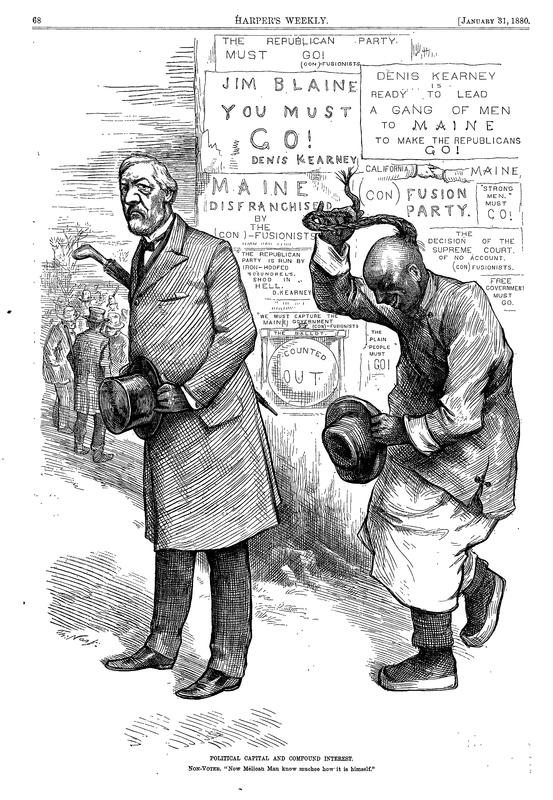 From this watercolor it appears Thomas Nast had direct contact with Chinese immigrants. Furthermore, dating the image to the antebellum era of the New York cigar wrappers, as Tchen suggests, explains Nast’s appearance. Nast first gained recognition as a Civil War illustrator for Harper’s Weekly. Before the war and his own fame, Nast would have had a.) possibly more time to paint, b.) had not yet grown the facial hair (as seen in the 1859 image above) and c.) he may have not yet created his distinct signature found on his later cartoons with Harper’s. Whether Nast did or did not meet a Chinese person in his lifetime, this painting clearly demonstrates an attitude toward them. It depicts a harmless and ordinary patronage of a Chinese-owned business and clearly, Nast is not afraid to interact with Chinese shop owners or their employees. The signature on the painting is quite different – plain and not stylized. Apparently, a precedent exists – as this watercolor from Arader Galleries indicates. It is attributed to Thomas Nast and establishes that Nast printed his signature without the flair in his early pre-fame work. The owner also sent me additional images in hopes to find further information. Nothing is written on the back. I am excited for Susan’s new find and so glad that she shared it with me. If indeed, it is an authentic Nast watercolor, it is extraordinarily special for its Chinese subject and self-portraiture. It is the only known image (in my experience) that includes Nast with Chinese-Americans. Speaking on behalf of both the owner and myself, we would love to hear from Nast experts and curators concerning this watercolor. All photos of watercolor taken by owner and provided to this website with permission for use. Follow up January 11, 2016: The owner of the image contacted Ryan Hyman, curator at McCollough Hall, and in viewing the photographs only, Hyman proffered that the painting is consistent with other Nast watercolors and the signature similar to others found in the early 1850s, a pre-fame period when Nast was a young adult and a practicing art student. 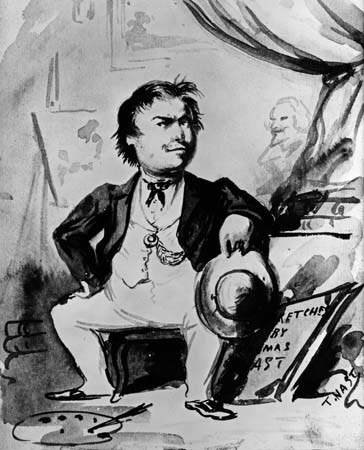 Hyman thought the image of the short man/patron could indeed be a Nast self-portrait. The printed signature is also consistent with Nast before he became famous. I advised Susan to seek out a professional appraiser, allow the painting to be personally examined and appraised, date the paper, etc., in order to establish its authenticity. 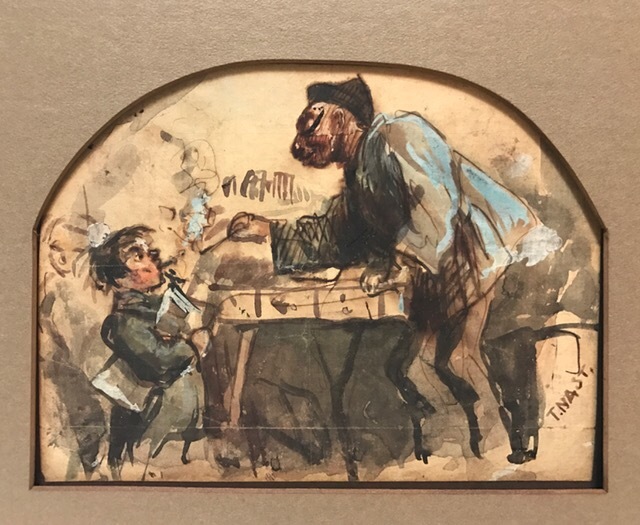 If authentic, and I think it is, the existence of this painting certainly suggests that Nast did personally meet and do business with Chinese people in New York City. 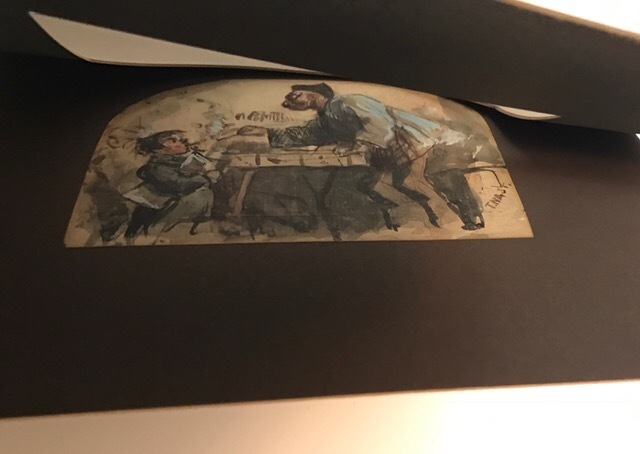 There were few Chinese in New York City at this time (in the 1870s, only in the hundreds) so in the 1850s, it would have been quite a memorable experience for a young Thomas Nast, one worth documenting as a visual memory by means of this most interesting watercolor. I came across this fascinating site from Princeton University’s Graphic Arts blog. They got a hold of Nast 1860 European passport. Before the Civil War and employment with Harper’s Weekly Nast and as the passport stamps and registry shows, traveled extensively in Europe.